SHM Mailers was formed in 1978, mostly catering to the central New Jersey direct mail community. SHM was primarily a provider of ink jetting self-mailers and handling of smaller, more complicated inserting and hand assembly projects. The company gained a reputation as a company that delivers. In 2007 Ken Maisel, formerly of Coupon Service Corporation (a large volume direct marketing company in Jersey City, NJ), purchased SHM Mailers. With the retention of virtually all the existing staff, in addition to a 40% increase in personnel, SHM underwent a significant change and expansion. Since 2007, two high speed inkjet systems and nine (5 color, 4 black) high speed laser printers were added. In a coordinated effort, the company has invested in requisite finishing equipment and software to stay ahead of the curve. Finishing equipment is used to slit, score, and glue. Extensive software purchases have been implemented to be able to drive the process. 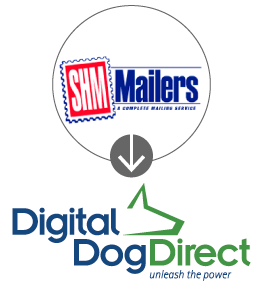 The summer of 2011 created the moment in time for SHM Mailers to emerge as Digital Dog Direct. A new name and a state of the art new facility created the answer to the new digital marketing marketplace. Digital Dog Direct continued to provide exceptional service to its local and regional long standing clients. We are proud of our past and embrace our future. Today, we’re a premiere multichannel marketing partner for organizations ranging from local area businesses to Fortune 500 companies. From concept to completion, we’re with you every step of the way to offer response-generating and cost-saving solutions. Get in touch today, and unleash the power of Digital Dog Direct.